Growing enrollment, enriching student experiences, and expanding online degree programs into new markets are among the top goals as Middle Georgia State University plans for the next five years. The University just released "Elevating Middle Georgia," a five-year strategic plan that maps out a vision of where the institution wants to be by 2023 and how to get there. "Elevating Middle Georgia speaks to our service to the public and our mission of graduating students with credentials that will enrich their lives and the communities in which they live and work, " said Dr. Christopher Blake, university president. 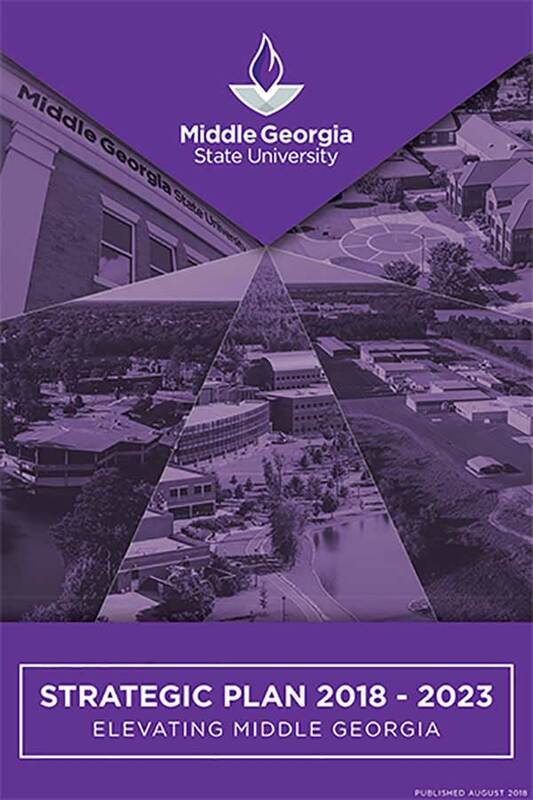 "In developing this strategic plan, we considered Middle Georgia State's unique features and challenges," said Dr. Jon Anderson, Middle Georgia State's provost and vice president for Academic Affairs. "We have a blended function - remaining accessible to first-generation college students and also fulfilling the mission of a traditional state university. Middle Georgia State is spread out over five physical campuses yet has a growing online presence. We are the only public institution in Georgia with a School of Aviation. "Our strategy outlines a path that will help the University manage those different assets in ways that strengthen student and alumni success and contribute to the vitality of the region and the state." Grow enrollment with a purpose. Strategies to achieve this goal include expanding and enriching the face-to-face student experience; and expanding and enriching online degree programs in new markets. Own student success. One strategy to achieve this goal includes developing obstacle-free pathways for students to progress from prospective students to engaged and employed alumni. Another strategy is to expand student involvement in community service and learning-through-experience opportunities. Build shared culture. Strategies to achieve this goal are to attract, retain and nurture faculty and staff talent; sustain the University's financial health and increase need-based aid for students; and to cultivate engagement to elevate the institution and the region. In practical measurements over the five-year period, the University plans to grow enrollment from about 7,340 to 8,900, increase annual campaign giving from $850,000 to $1.25 million, increase the number of degrees awarded annually from about 800 to 1,200 (bachelor's and master's degrees), and boost needs-based aid awarded to students from $330,000 per year to $750,000. More details about the "Elevating Middle Georgia" strategic plan are at mga.edu/strategic-plan. The webpage will be updated regularly to reflect the University's progress. Questions and comments are welcome and can be emailed to strategicplan@mga.edu.